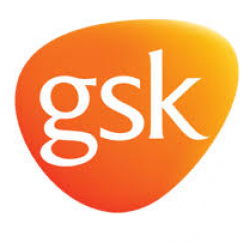 The idea that a dividend aristocrat like GlaxoSmithKline (LON:GSK) would ever cut its dividend may be unthinkable to many investors. The pharmaceutical giant has consistently paid dividends since the 1980s and dividend ETFs like S&P UK Dividend Aristocrats have invested huge chunks of money in Glaxo. Nevertheless, recent years have seen a number of blue chip companies, including Tesco, Rolls Royce and Rio Tinto reduce their dividend. Although Glaxo has not cut its dividend, the rate of dividend growth has already slowed considerably. 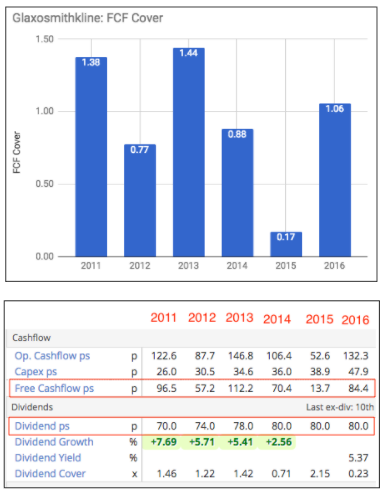 Cash payouts have remained static at 80p per share since 2014. Dividend hunters may find this frustrating, but there are a number of metrics that investors can use to understand why dividend growth slowed in the past, and assess whether dividends could rise or fall in the future. I will use this article to discuss these metrics, paying particular attention to GlaxoSmithKline. Why hasn’t Glaxo increased its dividend? In order to assess dividend safety, it is important to check company cashflows. Whenever a company pays a dividend, investors receive a cash payment, so dividend growth may stall if a company doesn’t have much cash. This is exactly what has been happening with GlaxoSmithKline. The latest interim results explained that the firm 'intends to build free cash flow cover of the annual dividend to a target range of 1.25-1.50x, before returning the dividend to growth.' The cashflow cover is calculated by dividing free cashflows (FCF PS) by the dividend (DPS). A firm with a higher cashflow cover is deemed to have a safer dividend. We can see from the above graph that GlaxoSmithKline’s cashflow cover has been lower than 1.5 every year since 2011. Furthermore, the cover has been below 1.25 each year since 2013. Glaxo had a FCF PS figure of 84.4p for the year ending December 2016. A 1.25 cover ratio would mean that Glaxo will need to have 100p in FCF PS by the end of the year (ie. 100p = 1.25 times 80p). As such, the FCF PS figure would need to grow by 18% this year in order to reach the 1.25 target. In essence then, recent cashflows haven’t been strong enough to support a higher dividend. So let’s explore why free cashflows have been low. Well done Alex for so much detail in your write up. I have had a look at the Stoco screen & noticed net profit for 2016 was £912M but estimates this year is massively increased to £5,398M. Also the ROE has gone through the roof at 278.8. So since they need profits to pay the dividends with, there should be more than enough to pay out more dividends. There is also the new flue virus just starting this year which should be good for them too. It is also undervalued and the share price is on an up trend. I have found from dividenddata .com.uk a very useful site to sort out dividends with XD dates and payment dates. For example SIHL goes XD tomorrow with a yield of over 10% and paid out this month. This is a bit of a strange share that is traded on the UK market, but it is shown in $ but the spread is quite tight 66.78p/67.09p earlier today. Worth getting a few more before the market closes. No new drugs, no new revenue. Thank you for an excellent article. I have held Glaxo for many years although I do not rely on the dividend. However a cut would be unwelcome because of the effect on the share price. It might be a sensible thing to do though to pay down some of the debt. Great article. Would be interested to see your take on the projected increase in net profits of 250 percent next year and projected divi cover going up to 1.4 from the current levels..
How do those figures fit in with your suggestion that it may be a likely candidate for a dividend cut ? Thanks for reading and the feedback. Much appreciated! Mikeyflange: the dividend could possibly rise to 80.5p - but we simply don't know for sure. There are lot of cashflow pressures stemming from pricing issues, generic competition, the CapEx budget and the put option liabilities. These factors will make it hard to increase the dividend, at least in the near future. The current dividend rate would also come under pressure if there was a sudden plunge in sales/profits - eg. a profit warning, for whatever reason. In terms of the forward looking figures, we should remember that the broker consensus has actually drifted down over the last few months - since the latest interim results (released in July). See below. Broker estimate momentum has historically been a good predictor of share price returns - see here http://bit.ly/2ywEdtF . So profits may be scheduled to increase, but the fact that brokers have cut their numbers over the last few months could be a bearish signal. interesting stuff. The thing that surprised me is that you're long GSK after all that gloom! Good article thanks. It's usually a sign of wishful thinking when a dividend is held flat for a number of years and yet I still have a small holding in GlaxoSmithKline (LON:GSK). Investor psychology eh?